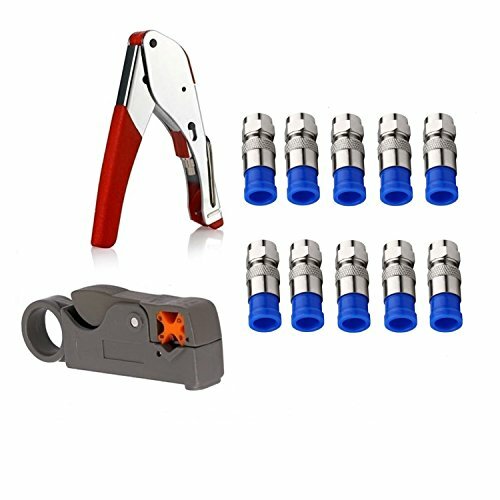 Coax Cable Crimper Kit Tool for RG6 RG59 Coaxial Compression Tool Fitting Wire Stripper with Gaobige 10 PCS F Compression connectors - Grey by Gaobige at In The National Interest. MPN: GJ-10-GREY. Hurry! Limited time offer. Offer valid only while supplies last. Features:Very easy to cut cable once you adjusted the cutting depth for cable. Fully adjustable and replaceable blades can strip cable perfectly. If you have any questions about this product by Gaobige, contact us by completing and submitting the form below. If you are looking for a specif part number, please include it with your message.